Seriously, without my spreadsheet I would be lost. Lost! (Click here to view it in all it's glory, and read on for how to use the features to filter what you are looking at!) 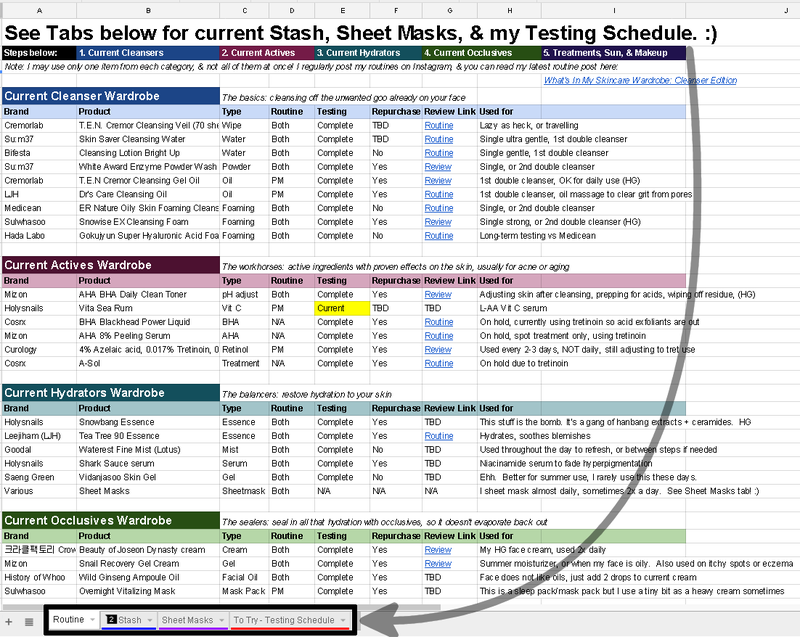 Recently a friend let me know that my spreadsheet is apparently appreciated by others as well, so I thought I'd post a quick guide on how to navigate it for the curious. 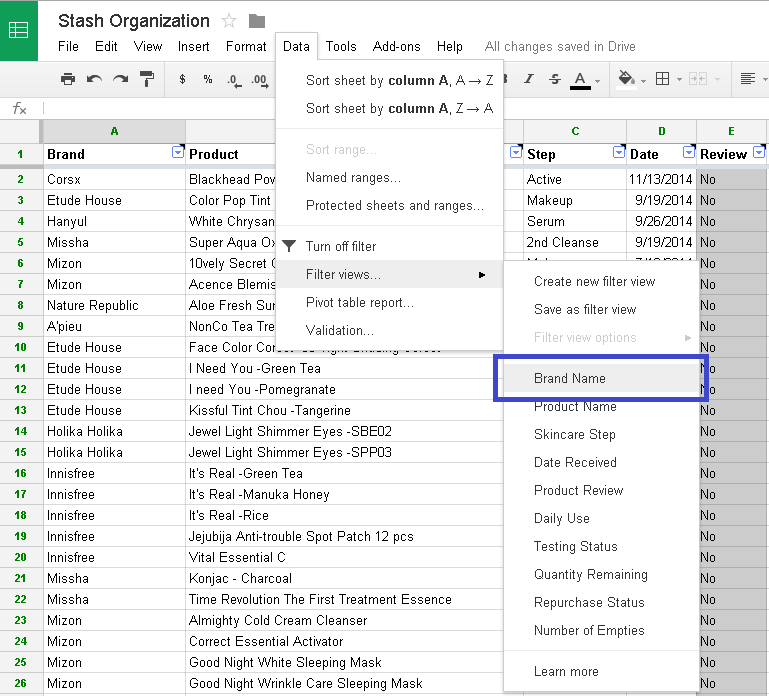 2016 edit: My spreadsheet has updated quite a bit since writing this post, but the sections for my routine, stash, sheet masks, and testing schedule are all present and still applicable. In beauty adventures this month, I managed to not only completely lose my camera (it was eventually located in the bottom of the fruit bowl, buried beneath apples of indeterminate age, where it migrated while charging, apparently?) but also need a new computer. Fortunately I have a very logical spouse who pointed out that the close proximity of my birthday to Christmas, and the fact that I skipped both last year for financial reasons, it was clearly a perfect opportunity to replace my laptop. I did not complain; at least not until I experienced the unique hell of Windows 8, but that's a whole other show. This may sound silly but what does "actives" mean and what is the # of emptys column for? Not silly at all! Technically, AHA and BHA are also actives, along with other acids, Vitamin C serums (mine is an LAA so technically an acid but not used for exfoliation) and things like Retinol. There are others as well, particularly in prescriptions given by dermatologists. 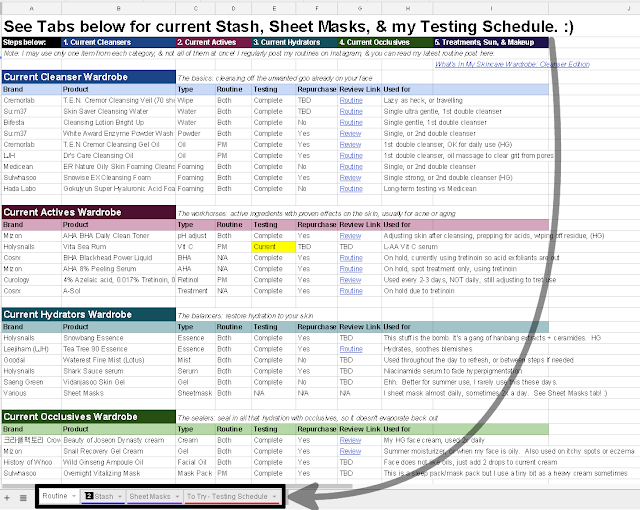 I love this so much I'm gonna make a few spreadsheets for myself too <3 I could use a little order on my cosmetics.